How Many Officers Are Killed in Traffic-Related Incidents? With so many mourning the death of state Trooper Thomas Clardy, whose cruiser was struck on the Massachusetts Turnpike in Charlton, some see him as the latest victim of a persistent problem. Traffic-related incidents were the leading cause of death for law enforcement officers in 2015, killing 52 officers nationwide. According to data compiled by the National Law Enforcement Officers Memorial Fund, 35 officers were killed in automobile crashes, 11 were struck killed outside their vehicles and six were killed in motorcycle crashes. "It's a tragic, tragic set of circumstances," said former Massachusetts State Police Col. Timothy Alben. The numbers do not surprise Alben. Since the early 1900s, state police have lost 42 officers in the line of duty - 27, or more than 60 percent, were killed in traffic-related incidents. "There are no goodbyes here. There's no opportunity to hug your loved ones one last time," said Alben. "You don't have control over the drivers that are out there." 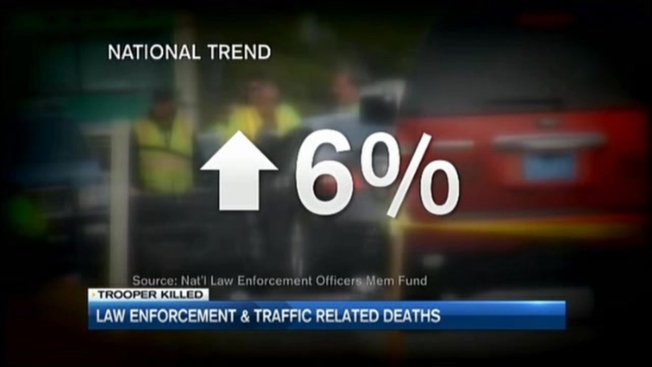 The national numbers reflect a six percent increase in traffic-related deaths over 2014. In contrast, the number of firearms-related law enforcement deaths dropped last year, from 49 officers killed in 2014 to 42. Alben does not want to speculate in any way on the circumstances of Wednesday's crash that killed Trooper Clardy, but said troopers face risks on the road every day. In recent years, Alben says, state police have pushed to make changes to keep troopers safer. "Markings on the cruisers, about technology used in dome lighting, about placement of cars at traffic stops, about outerwear that's worn by our troopers," he listed.